The events have been in the format of interactive activities for local primary school children and family groups where audiences have the chance to speak to a broad range of researchers who are at different stages of their careers. The events started in the Division of Molecular Microbiology in the format of “Magnificent Microbes” where the wonders (and horrors) of the unseen microbiological world are uncovered. The activities are related to the active research programmes of the teams based in the School. An iterative process of evaluation and refinement following each event has allowed improvements to be made over the years. Inspired by the success of “Magnificent Microbes”, researchers from the Division of Cell Signalling and Immunology embarked on a sister event coined “Incredible Immunology” which was held for the first time in 2015. Following a similar model to that established for Magnificent Microbes, a series of training events, discussions, and a testing day prepared the researchers for the event. An annual event where we will give members of the general public a rare chance to come into the School of Life Sciences to experience some of the cutting edge research being carried out in Dundee. Through posters, demonstrations and exhibits, the scientists explain what, how, and why, they study the important research questions they do. There are also research-themed tours of laboratories throughout day. Outer Space | Inner Space is a science communication venture, creating an adaptable immersive space in partnership with Leisure and Culture Dundee at the iconic Mills Observatory. 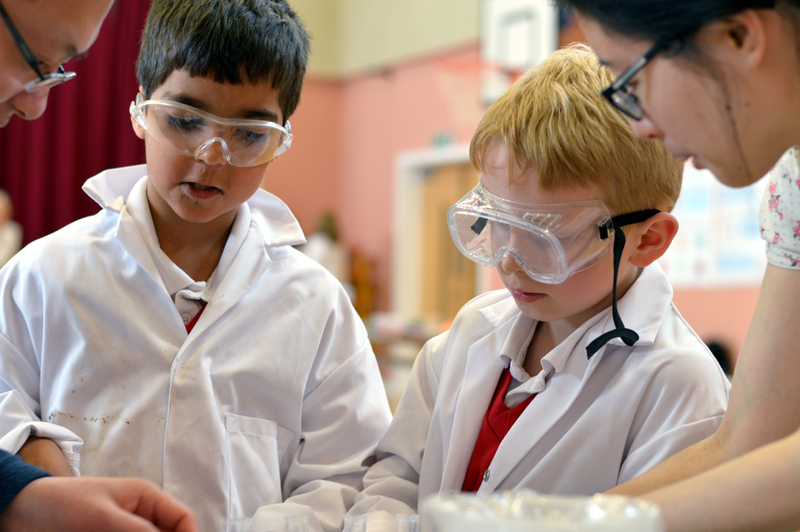 A science outreach programme with facilities that allow accessible, interactive exploration of the cutting-edge research from Life Sciences created in collaboration with the School of Science and Engineering. The technology used also ensures that all audiences, especially people with impairments, can experience and interact with the installations. Animating Science is an exciting pilot project where the School has partnered with Dundee Contemporary Arts Learning as part of their public engagement programme, and with local primary schools to support teachers and pupils in the creation of new art/science collaborative projects. Animating Science aims to develop stop motion animation skills with pupils and teachers (P7 - S3) and support them in creating animated films about Life Science concepts and processes. LifeSpace is to engage artists and scientists in exciting new collaborations and to foster long-term cross-disciplinary activity that will provide these communities and the public with greater insight into the broad spectrum of life sciences research. This research-driven gallery space is curated as a collaborative partnership between researchers from Duncan of Jordanstone College of Art and Design and researchers from the School of Life Sciences. It enables an exciting opportunity for interdisciplinary art and science interactions as well as providing a location for curatorial exchange between staff, students, researchers and the general public. The iGEM Competition is the premiere student team competition in Synthetic Biology which has been encouraging students to work together to solve real-world challenges by building genetically engineered biological systems. Student teams design, build and test their projects over the summer and gather to present their work and compete for prizes at the annual Jamboree. The University gathered a team from local schools (from St Paul’s RC Academy and Grove Academy) to take part in 2016. Lead by Prof Frank Sargent and postgraduate student mentors, they focused on designing a system to combat bacterial infections found in drinking water in the developing world. The High School iGEM team, presented their work at the Jamboree in Boston, Massachussetts, USA, on 27-31 October 2016. They won a Gold Medal and were nominated for Best Presentation; Best Part Collection; Best New Composite Part; and Best Poster. Throughout the year, Plant Sciences run events aimed at reaching a wide audience, from school children to adults. The scientists are passionate about engaging the public about their research and the critical importance of plants in all of our lives. Their flagship event is their annual Power of Plants day at the University of Dundee Botanic Gardens in collaboration with them and colleagues in the James Hutton Institute. In November 2014, BBSRC-funded researchers showcased the best of British bioscience at the Great British Bioscience Festival in London's Bethnal Green, attracting over 6,500 visitors. Professor Nicola Stanley-Wall led a team to teach the public about her research with an activity, Biofilms: Building Bacterial Cities. The School takes part in a number of events for schools each year in order to enthuse and motivate children about the world of science.